There are a number of different ways to go about choosing a color scheme for your cubicle panel extenders. You can try to match or complement the rest of your décor. Or, you might choose a color that represents your branding/logo. If neither of these options is appealing, you might also consider using Feng Shui to help you pick a hue that creates just the right vibe. There’s a blog post up at the Business Interiors Water Cooler about the symbolism of colors in the office space. It’s pretty fun to use this kind of system to help you make the best choice. Here’s a little bit about some of the colors we have available in our polycarbonate tile panel extenders and how to use them to your advantage. Red is the color of action. Want your sales team to get results? Cap their cubicle panels with bright red panel extenders. Yes, red is a little aggressive, but sales reps can enjoy the invigorating effect of a little healthy competition. Yellow is the color of optimism and creativity. Use it in areas where your workers need to come up with ideas. 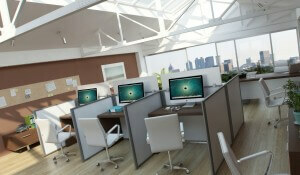 Great for brainstorming and to lift the mood of an office space that doesn’t get a lot of natural sunlight. Blue is a color for peace and stability. This is a color to use if you want a more quiet work environment where workers can stay focused. It’s hard to stay agitated when you’re surrounded by a calming blue sea. So, try this color for areas where coworkers don’t always get along. Green is the color of growth. Consider green panel extenders to breathe new life into a department that’s experiencing stagnation. Younger workers are especially likely to respond well to this hue. Who says you have to pick just one? You could consider dividing your office space up by tile color to indicate different teams or departments.